IRIS OpenSpace is a cloud based solution and provides safe, simple and secure data transfer. One of the main principles of GDPR is integrity and confidentiality, requiring PKB as the data processor to ensure appropriate security. In order to achieve this, PKB Accountants will be using IRIS OpenSpace as our secure document exchange to send and receive documents for your approval and/or signature. Sending documents via email is no longer considered secure under the new regulation. To comply with the General Data Protection Regulation by the deadline date of 25 May 2018, we will be adding all our clients where possible to IRIS OpenSpace. PKB will be inviting all clients we hold email addresses for to IRIS OpenSpace. Please look out for an email that looks like this and when you receive it, follow the instructions to activate your IRIS OpenSpace account and we’re ready to go. Remember to check your Junk mail as it could be hiding in there! Q. I have received a ‘Client Registration’ email – what should I do? You have received an email that looks like this. This means you will be able to send and receive documents to/from PKB in a secure environment. Simply click on the link in the email to activate your account and create your password. Please contact Rebecca Austin if you require assistance or you haven’t received your registration email. Q. How do I upload a file to send to PKB? Click Upload in the toolbar. Click Browse and find the file (or files) you wish to upload. Select the file (or files) and click Open. The upload will then start automatically. Please note the time it takes to upload a file is dependent on the upload speed of your internet connection, which may be considerably slower than your download speed on a typical residential ADSL line. Q. How do I approve (or reject) a document? Review the contents of the document. Click either Approve or Reject as appropriate. PKB will be notified by IRIS OpenSpace of your action. 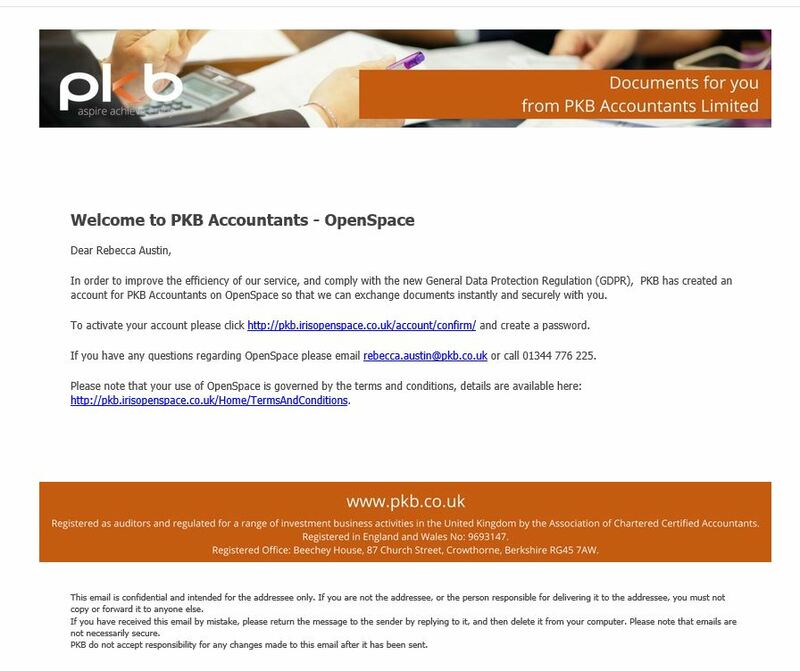 If you have any further questions relating to the use of IRIS Openspace or GDPR, please do not hesitate to contact me on 01344 776225 or rebecca.austin@pkb.co.uk. Also, please read our GDPR Client Information Sheet for more information on what GDPR means to you.